New York-Since long time immigrant Indians living in New York were forced to take flight from New Jersey Airport for going to Mumbai, due to which lot of wastage of time was taking place. Their demand was to start direct Flight between Mumbai-New York-Mumbai. 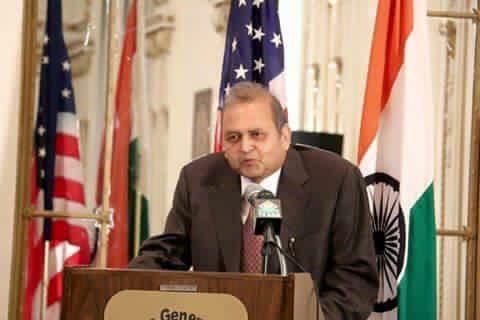 Social worker and Chairman of Jaipur Foot USA Prem Bhandari, expressed his gratitude to the Air India CMD for starting nonstop/direct flight from Mumbai-New York-Mumbai thrice a week from 7th December and fulfilling this demand of Non-Resident Indians. Bhandari was speaking as a keynote speaker to the NRIs in the Longisland, which was held to address the problems related to passports, air lines and other issues. Bhandari informed that he recently wrote a letter to Air India's CMD Pradeep Singh Khurla and apprised about the various problems of the immigrants and urged him to resolve them promptly. Importantly among them is non getting visa, hospital admission, charging date change penalty & other charges in case of death of near relative were opposed and he informed about necessity of paying attention towards maintenance of aircrafts, etc. He described corruption in Air India as responsible for the poor condition of the airlines. At the same time, he demanded to stop up-gradation from general category to executive and 1st class in respect of Ministers, Leaders, Officers wives & staff, etc. He also informed in the letter that in this way Air India is losing about Rs 4 Crore from only one seat upgrade in Delhi-New York flight throughout the year. Bhandari suggested to make the Air India website more user-friendly and to increase the capacity of the call centers. He also appealed to immigrants to buy international air tickets through the website and call centers as far as possible. Bhandari, in the end, praised the positive attitude of the CMD Singh and also thanking him for assuring immediate action on his letter on telephone.